What is a relaxation chair? 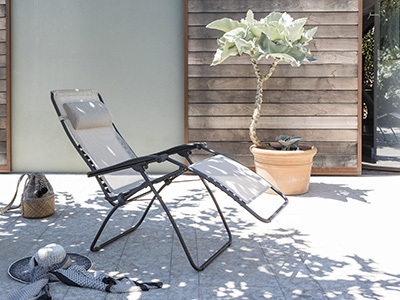 All indoor or outdoor furniture, from a chaise longue to a rocking chair, even if it proves to be comfortable, is not necessarily designed to offer optimal relaxation. A relaxation chair is more than a simple ergonomic seat. With its high multi-position backrest, its adjustable headrest cushion, its adjustable footrest and its armrests, it allows the user to relax, in the ideal relaxation position. Today, there are various versions of the relax chair. The manual relaxation chair has the advantage of being simple to use, as it does not need a battery or mains power. 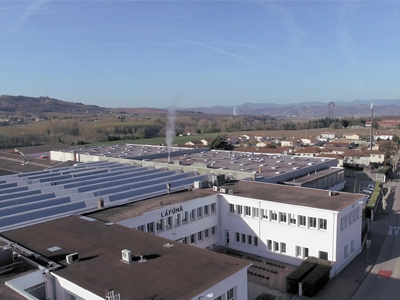 The manufacturers use their knowledge to create optimal ergonomics to promote relaxation. Among the versions of manual relaxation chairs, some require light pressure from the body in order to recline completely flat. It is recommended that people who suffer from back problems should choose a model with notches and a latch which is adjusted by hand before sitting down, such as a chaise longue, for example. This type of chair also has the advantage of being easy to move, from the living room to the garden, and easy to store after use. This type of chair is often recommended for elderly people, those with reduced mobility, or recovering from an accident. The user adjusts the incline and position using a lever or remote control. Even when recommended for certain cases, particularly for a medical reason, a powered elevating chair will still be bulky, expensive, hardly suitable for small spaces, and requires a mains power outlet nearby. The seat depth and backrest height play a determining role in overall comfort. Size is an essential criterion. It is better to opt for a model with a backrest and an adjustable headrest and leg rest. Also, a chair’s comfort cannot be judged from how cosy it looks. One that is too soft, with soft padding, will have a tendency to sag. If you choose a model designed with padding, opt for durable foam with a high density. To guarantee optimal back support, it is recommended to choose a firm material. Think about the potential use of the relaxation chair. These relaxation models can also be used as a living room chair or desk chair. But these chairs are also used outdoors during the summer. 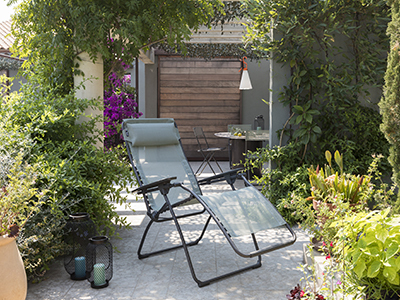 In order to use the relaxation chair in various contexts, it is better to choose a light, multi-function product to be able to have those relaxing moments in the garden, and also when on holiday. Chairs from a collection of portable furniture are easy to transport. The aesthetic aspect also needs to be taken into account to best match the relaxation chair with, for example, the living room furniture. Colours and especially materials should be looked at. Also, not all covers have the same quality. A chair with a removable fabric or microfibre,synthetic or leather-look cover has the tendency to wear more quickly than a chair in real leather, but this latter requires regular care. Also, the disadvantage of these materials is that they are designed for interior use. To move the chair to the patio whenever you please or back to the fireplace in the winter, the choice of fabric is of most importance. 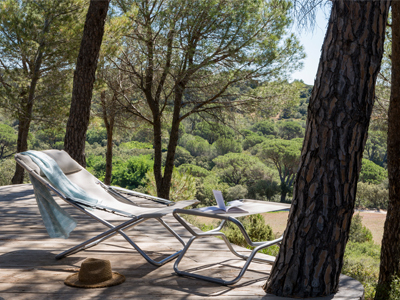 At LAFUMA Mobilier, we design innovative furniture which is conducive to relaxation. It has been shown by the medical profession that an individual relaxes better when he cannot feel the weight of his body. This is why we have incorporated the concept of “zero gravity” into our relaxation chairs to provide a feeling close to weightlessness. The LAFUMA Mobilier relax chair offers the perfect position as it allows for the alignment of the heart, legs and back in order to promote a rapid decrease in stress. The thighs and trunk form an angle of 127 degrees, the perfect angle for relaxing. This relaxation chair, originally designed with doctors, was developed to ease back muscles, the neck and lumbar discs; to improve circulation and thus calm breathing. It is specially designed for outdoor use and resists both UV rays and moisture, thanks to an anti-bacterial and anti-fungal treatment. In order to improve the comfort of models in Batyline® fabric, an ergonomic cushion topper, designed in a breathable waterproof material, Air Comfort® which is an innovation by LAFUMA Mobilier, can be added. Easy to maintain, our relax chair is also easy to store after use as it does not take up much space.